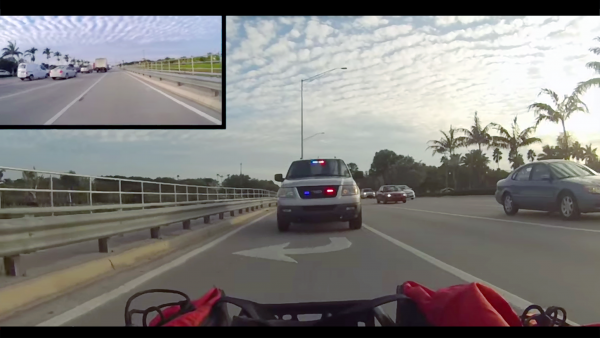 Bicyclists across the US, including a number in Florida 1 and California 2 have recently reported that they were harassed by police and ticketed for riding in the center of travel lanes that are too narrow to share safely side-by-side with cars and trucks. 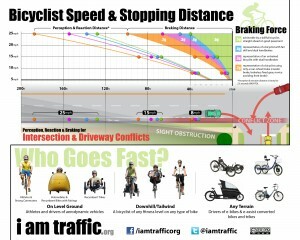 Florida and California have bicycle-specific laws 3 4 modeled after Uniform Vehicle Code § 11-1205(a), which requires bicyclists to ride as far right as “practicable” when traveling slower than other traffic. 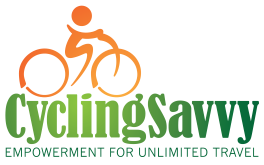 5 Like the UVC version, the Florida and California bicycles-stay-right laws include an exception for lanes that are too narrow for riding side-by-side with a motor vehicle to be safe (in addition to many other exceptions such as on-street parking and surface hazards). Unfortunately, many police ignore the exceptions and use the stay-right requirement to harass or ticket cyclists whenever other traffic must slow for them. When so many bicyclists operating according to best practices are cited for violation of the law, we must conclude that there is something wrong with the law. When so many bicyclists operating according to best practices 6 are cited for violation of the law, we must conclude that there is something wrong with the law. 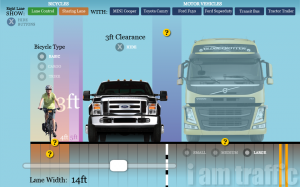 One observation is that since most travel lanes are 10 to 12 feet wide – too narrow for safe side-by-side sharing by a typical SUV, much less a truck or bus 7 – the law has the general rule (stay right) and the exception (narrow conditions) completely backward. Police officers assume that the law wouldn’t be written the way it is unless bicyclists should stay to the right edge of the lane most of the time, and so they send lane-controlling bicyclists to court again and again, only to have such cases dismissed. 8 This poorly conceived and written law generates needless conflict between police departments and the bicycling community. A somewhat better bicycle-specific law would declare bicyclists’ right to a full marked travel lane as a general rule, and define the exceptional circumstances where same-lane passing may be allowed. (Multiple criteria must be met: An especially wide lane allowing abundant passing distance given the vehicle width, a location away from intersections, safe conditions at the right edge of the lane given the bicyclists’ speed, and so forth.) The states of Colorado and Montana have each modified their bicycles-stay-right law with a step in this direction. The driver of any vehicle traveling slowly can satisfy this law by using the right hand thru lane; only if there are no marked lanes is such a driver compelled to operate “as close as practicable” to the road edge. When a bicyclist is pulled over in a state with a bicyclist-specific FTR law, any discussion about the statute requires explanation and interpretation of a long list of exceptions. This places a burden on the bicyclist to thoroughly know the law and to be articulate and diplomatic in her explanation. It also increases the likelihood she may have to ultimately fight an unjust citation in court. Having no discriminatory bicycle-specific stay-right law doesn’t make lawful cyclists immune to police harassment rooted in ignorance and bias. A lack of adequate police education about bicycling in North Carolina has resulted in many bicyclists (including myself) being pulled over by police who felt we shouldn’t be riding in the center of a narrow lane. The difference in North Carolina is that when the stopped bicyclists invite police to look up the statute, the officers usually recognize their error about the state law. The contrast between an unfair citation and a teachable moment is of great significance to the bicyclist. It’s possible that some bicyclist somewhere in North Carolina has paid a ticket for violating our state’s generic slow vehicle law, but our statewide advocacy organization isn’t aware of one, and we are vigilant. 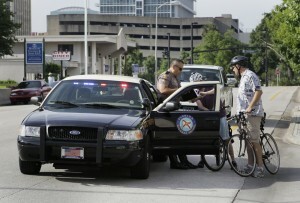 Bicyclist advocates in North Carolina are actively engaging local police departments to promote better police relations and improved public safety, including education about best bicycling practices. When discussion of bicyclist positioning on the roadway comes up, we explain the technical issues of why it is often safer to ride in the center of the lane or control it by riding double file. This conversation with police is made much easier by the fact that North Carolina has no bicycle-specific stay right law. Question: “Don’t bicyclists legally need to stay to the right side of the lane?” Answer: “No, state law treats bicyclists the same as the driver of a slow moving tractor; they can occupy a travel lane. Next question?” Our state Driver Handbook underscores this point. “Bicyclists usually ride on the right side of the lane, but are entitled to use the full lane.” 11 North Carolina’s vehicle code clearly defines bicycles as vehicles and bicyclists as having the rights and duties of drivers of vehicles. Bicyclists don’t need a vehicle-specific law to telling them where to ride in a marked travel lane – or that they are allowed to occupy travel lanes in the first place – any more than motorcyclists do. Do bicyclists in North Carolina ever control a wide travel lane under conditions where it creates an unreasonable delay for motorists, but with no real safety benefit? Yes, but such situations are very rare, firstly because so few lanes are truly wide enough for this to be safe, secondly because roads that carry substantial traffic will usually have an additional same-direction lane for passing, and thirdly because cyclists will usually move to the right as a courtesy when it will make a significant improvement for others. Contrary to what some people may think, bicyclists are human beings who typically care about other people, and some have written a good deal about this. 12 The rare cases where motorists experience significant delays from unnecessary control of wide lanes are too few and far between to warrant adopting a law that invites abuse from police and encourages unsafe edge riding. Living without laws that punish bicyclists for being slower than motorcyclists and narrower than tractors has worked well in North Carolina. Bicyclist advocates in other states would do well to pursue the same full driver rights. UVC § 11-1205(a) requires bicyclists to ride as close as practicable to the right hand side of the roadway. This provision is very unpopular with bicyclists for a number of reasons. It treats the bicyclist as a second class road user who does not really have the same rights enjoyed by other drivers but who is tolerated as long as he uses a bare minimum of roadway space at the side of the road. The provision is also frequently misunderstood by bicyclists, motorists, policemen and even, unfortunately, judges. The provision requires the bicyclist to be as close to the side of the road as is practicable, which we all understand to mean possible, safe and reasonable. But many people apparently don’t understand the significance of the word practicable, and read the law as requiring a constant position next to the curb. Even where the significance of the word practicable is recognized, the bicyclist is exposed to the danger of policemen and judges who may have a different idea about what is possible, safe and reasonable, and he is exposed to the very real danger of motorists who, because of their misconception of this law, will expect the bicyclist to stay next to the curb and will treat him with hostility if he moves away from that position. Thanks for this, Steven! I have shared it with some of my local colleagues. To clarify: Your North Carolina statute appears to allow lane control anywhere on a two-way two-lane road with marked lanes, since as long as the bicyclist is riding on the right side of the road, they are always in “the right-hand lane then available for traffic”, since there is only one in that direction. So even if there is no safety or operational reason that would compel the bicyclist to control the full lane (it is of sufficient width to share laterally, there ae no edge hazards, bicyclist is not turning left or passing other traffic), he or she is still allowed to, as long as the lane is marked? And a question: Your statute uses the term “roadway” everywhere. I’m assuming there is a statutory definition of that, and it probably excludes paved shoulders? Our bicycle FTR law here in Maine is further screwed up by using both “roadway” and “way”, but the term “roadway” is nowhere defined in statute. “Way” is, and means the entire right of way. This can and has been interpreted to imply mandatory shoulder use, where practicable. But that conflicts with the statue which allows but does require cyclists to use paved shoulders. John, NC law describes no conditions where drivers must facilitate other drivers passing them within the same marked lane, regardless of the number of lanes. Where lanes are marked, the law simply prohibits use of the left lanes when traveling slowly except when passing or preparing for a left turn. The law does not discriminate against drivers of narrow vehicles in terms of allowing normal lane use. As a practical matter, bicyclists rarely ride in the center of travel lanes here when there is really no operational benefit to do so when at the same time riding to the right would provide significant advantages to other drivers – such as when climbing a hill on a two lane mountain road with a wide paved shoulder and heavy motor traffic. The much more common problem is bicyclists riding to the right when same lane passing is unsafe, conditioning motorists to expect this behavior, and resulting in complaints from motorists when cyclists control the lane for important reasons. The NC slow vehicle law NC § 20-146(b) actually says “highway,” which is inclusive of the shoulder, but since shoulder striping is associated with lane marking, the “as close as practicable” section does not normally apply to roads with striped paved shoulders. Vehicle operators are never required to operate on unpaved shoulders or sidewalks.